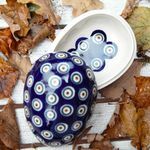 The size of this beautiful can in egg shape is 13 x 10 cm and it has a height of also 10 cm. The manufacturer, Ceramika Artystysczna pottery from Bolesławiec has traditionally decorated all these unique Bunzlau ornaments in elaborate handwork. The ceramic tableware from Boleslawiec is of course suitable for the dishwasher, the oven and the microwave.